My biggest complaint about hard shell bags is that I don’t think they have enough flexibility. Obviously, they’re made not to be too flexible, but the inability to make extra space in them like you can with softer luggage is pretty limiting. Every now and then I take a trip across country, and plan to bring back a bunch of stuff as gifts for my friends and family. While hard case luggage will protect the contents, I can’t add a whole lot of stuff if my suitcase is full to brimming in the first place! The Traveler’s Choice Tasmania luggage set is a set of hard cases, but they actually allow expansion. All three Tasmania’s can expand up to 25% while still being sturdy enough to protect the belongings inside. They also feature inside dividers that make organizing nerds super happy. Rather than just having a zip open pouch on top of the suitcase, there is an entirely separate compartment that zips into the cover. You get three sizes with this set. 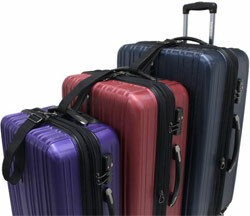 It features two big cases that, at 29 inches and 25 inches, can be used for car travel or checked baggage. You also get a smaller case that’s 21 inches in size. They’re available in 4 different colors ranging from demure to a little wild. Pick from black, navy, purple and red. The brighter colors are much easier to find on a conveyer belt, but the others are more business appropriate. The spinner wheels are actually double spinner wheels which is a great design feature because the case rolls much easier. Plus, it helps the case to stand up on its own due to more stability in the wheel base. This makes the cases a joy to maneuver upright and less likely to tip over if you take a hand off of them at any time. The 21 inch case doesn’t include any exterior pockets, so it’s not very handy as a carryon. It can still be used as one, but if you need quick access to something like boarding passes, chargers and the like, expect to open the entire case. For this reason, I think an exterior pocket would be really helpful. For small people like me, this set might not be the best bet because it isn’t lightweight. Many harder suitcases are a little heavier because they’re made of heavier material in general, and these are on the weightier side overall. That being said, this shouldn’t be a big deal because they don’t get lifted very often due to the wheels. My clumsy side loves the idea of hard cases, and an expandable hard shell case is pretty much the greatest idea I’ve heard in a while. 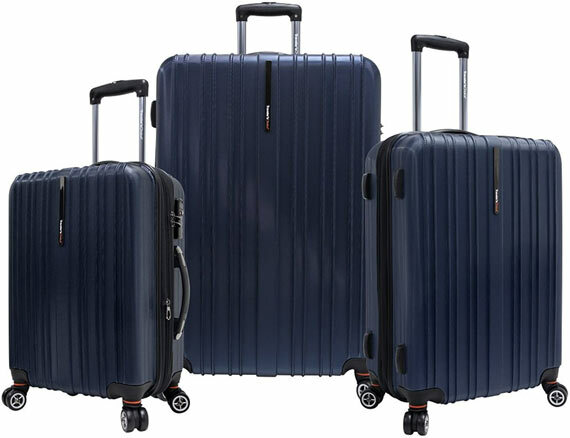 At almost $250.00 for the set these are not the cheapest suitcases, but they’re not anywhere near the most expensive ones on the market. Personally, I’m intrigued by the price and durability, and if you can work through the “quirks” mentioned I think this set is worth considering.